This entry was posted in Uncategorized on March 28, 2017 by Christy Rheu. This entry was posted in Uncategorized on April 27, 2016 by Christy Rheu. This entry was posted in Uncategorized on February 10, 2015 by Christy Rheu. This entry was posted in Uncategorized on January 20, 2015 by Christy Rheu. UKIAH — Pedaling and puffing up a sun-splashed canyon at about 6 miles per hour, I could see the cattle trotting down an off-road path on my left. They were slightly ahead, moving swiftly onto the road. The cattle swarmed onto the asphalt near Twickenham in Wheeler County on Saturday afternoon, covering the two lanes of Rowe Creek Road in a territorial fashion befitting a street gang. There were 11 of them trotting, looking over a shoulder, trotting faster than I could pedal. I rode behind at a safe distance. Three of them were pregnant, a few were calves and, thankfully, none of them were bulls. They were quite capable of moving uphill at or above 6 miles per hour, and they did. This running of the non-bulls was just one of the many memories I’ll take from a five-day ride in Eastern Oregon that began Friday in Heppner and concludes there, the Morrow County seat, today — Tuesday. Along the way, the ride will have covered about 300 miles, stopped in Spray, Mitchell, Monument and, tonight, in Ukiah. I spent quality time with the geologic wonder that is the Painted Hills for the first time since moving to the Northwest a quarter century ago. I lost track of whether we were crossing the main, middle, north or south fork of the John Day River. And I learned to come to terms and maybe even appreciate more than 20,000 feet of elevation gain. In short, the experience was magnificent. 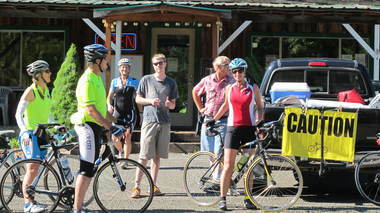 The ride was organized by Christy Rheu Waldner, a John Day-area resident who works part-time as a family law mediator. She has been putting together rides mostly for fun and very little profit since 2008. “It gets lonely in Eastern Oregon!” Waldner said, riding up a road and explaining why she does what she does. 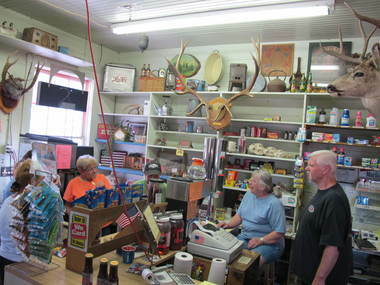 Waldner books motels, plans meals and maps the routes. 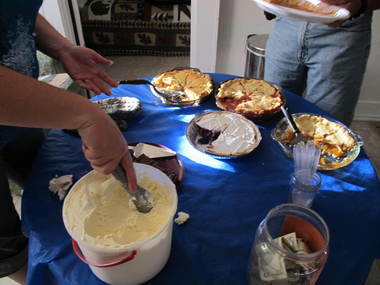 The first rides were mostly for John Day-area friends, usually held in June and September. She’s assisted along the route by her partner, Hans Magden, a retired John Day veterinarian and renowned expressionist painter. Ride routes stick to Eastern Oregon, as far west as Madras, as far east as Unity, as far north as La Grande and as far south as John Day. Waldner is only now getting around to forming a tour company — Over The Hill Bike Tours — and plans to launch a website next year. Waldner’s also a community booster. Nearly half the meals on our trip helped community groups who served them, like a the Horse N 4-H club in Spray (population 158) or the Future Farmers of America in Monument (population 127). In addition to Magden, Waldner’s other accomplice is Mike Cosgrove, who was among the nine riders who rode the five days of this journey. (Five others rode for two days.) Cosgrove, a retired John Day school counselor, calls himself the Grant County Cycling Ambassador and he’s chairman of Oregon State Parks and Recreation’s Scenic Bikeways Committee. The Oregon Scenic Bikeways is a collection of 12 routes the state has promoted as ideal places to bicycle. The idea was hatched by Cycle Oregon about four years ago as a way to advance economic development in tiny communities year-round and not just in the one week for which Cycle Oregon, co-founded by The Oregonian, has become known. Four other scenic bikeways are under consideration, in Lakeview, Oakridge, Ashland and the southern Coast. Communities apply for the designation and the Bikeways program checks it out, for community involvement as well as the route itself. The routes for two of our days have included roads in the Blue Mountain Scenic Bikeway and the Old West Scenic Bikeway. Travel Oregon, taking a cue from Two Wheels Spoken Here, has started a similar program called Bike Friendly for a handful of other counties. 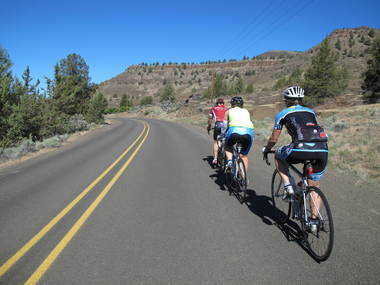 In September, John Day will serve as the host community for the first two nights of Cycle Oregon. Those two days will mean $75,000 to $100,000 a day will be left behind in the community, Cosgrove said. Finally, a word about that 20,000 feet in elevation gain, closer to 25,000 by the end of tomorrow. I’m not an expert in these matters, but that’s quite a bit of elevation gain. But it goes with the territory. While this ride has had its share of unrelenting uphills, for which I was pretty much totally unprepared, it has offered the flip wide with screaming descents. 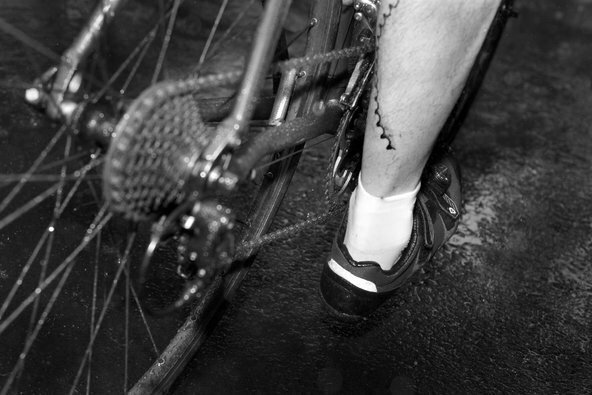 Mercifully, no flats on those descents. Every day has offered a new view of a Eastern Oregon. The weather has been perfect. I’ll be back. As for the cows, they kept trotting. I kept riding. A cow would look back, see I was still riding, and the pack would accelerate. This went on for about two miles. Finally, the road flattened a bit, I picked up speed, kept to the far side of the road and the cows stopped in their tracks and stared at me with all sorts of The Far Side thought bubbles appearing over their head. Cattle rustling in Eastern Oregon. Time to check mark another box on the bucket list. This entry was posted in Uncategorized on January 8, 2015 by Christy Rheu. 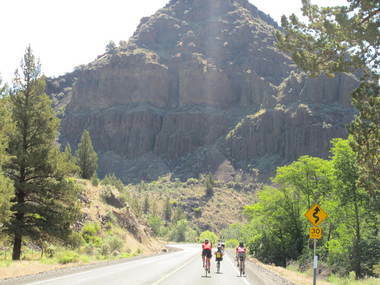 October supported tour on the Old West Scenic Bikeway in eastern Oregon. This entry was posted in Uncategorized on September 5, 2014 by Christy Rheu. This entry was posted in Uncategorized on August 29, 2014 by Christy Rheu. What are Christy’s tours like?